About 10 percent of the memorial's archival collection was kept on site, and many objects were in fireproof safes, officials said. 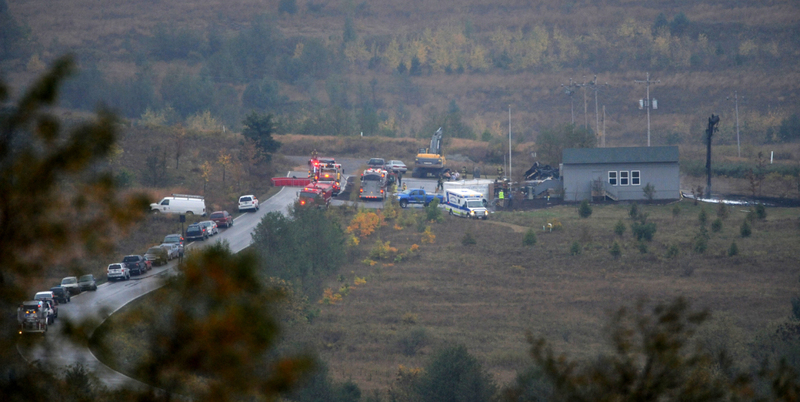 SHANKSVILLE, Pa. – A fire at the Flight 93 National Memorial destroyed three administrative buildings on Friday, leaving officials concerned about some of the memorabilia and archival material stored there. Wind-whipped flames didn’t touch the under-construction memorial and visitors center, which are about 2 miles away on the large property in rural western Pennsylvania, National Park Service spokesman Mike Litterst said. No one was injured in the fire, whose cause is under investigation. The buildings comprised the park’s headquarters, with conference facilities, storage space and the superintendent’s office. About 10 percent of the memorial’s archival collection was kept on site, and many objects were in fireproof safes, officials said. Park staff saved an oral history collection and photo collection. The Congressional Gold Medal awarded to the memorial last month was not on site, officials said, but a full inventory will have to wait. “Until the area is declared safe, however, staff will not be able to access the collection storage area and determine the condition of any other objects,” the park service said in a statement. Among the items whose status is unclear is a flag that flew over the U.S. Capitol on Sept. 11, 2001. Former House Speaker Dennis Hastert, who led the chamber on the day of the attacks, donated it during an anniversary ceremony last month. The memorial, in Shanksville, marks the spot where United Airlines Flight 93 crashed during the Sept. 11 attacks. The plane, which was traveling from Newark, New Jersey, to San Francisco, went down in a reclaimed strip mine after passengers fought back against its hijackers. All 33 passengers and seven crew members were killed along with the hijackers. A memorial plaza was completed in time for the 10th anniversary of the attacks in 2011. It features a white stone wall, which traces the path of the doomed flight, with separate panels for each victim. There are plans for a 93-foot-tall tower with 40 wind chimes. Officials have said they hope construction of the visitors center, which is estimated to cost $17 million to $23 million, will be finished by June. That would give park officials three months to install exhibits in time to open for the 14th anniversary of the crash. The president of the Families of Flight 93, Gordon Felt, issued a statement expressing sadness about the fire and saying the group awaited further information on the cause. All told, the park is expected to cost about $60 million. The government spent another $10 million for the land, which is about 75 miles east of Pittsburgh.